You can also send a one-time payment or tip to me on Paypal! My email address is augiepetersonauthor@gmail.com. I have three tiers ($1, $3, and $5) that include exclusive pictures of my cat Pumpkin, merch discounts, personalized thank you cards, minisodes, and early access to podcast episodes, stories and movie reviews! 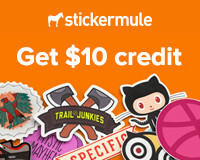 If you’d rather get something physical in return, you can click on this text and get a $10 credit to Sticker Mule. When you buy, I also get a $10 credit to use for my own stickers. Thank you to those that have already pledged! You’re contributions mean the world to me!